Transport to bushwalking areas in Darling Range near Perth, Western Australia. WalkGPS. The walk areas are mainly remote from public transport; You will require a reliable private car to reach most start points. One of the many benefits of becoming a member of one of the local bushwalking clubs is joining others on walks and sharing the transport costs of fuel etc. Also, compare the value for money of your invigorating day in the outdoors compared to a brief visit to your local health club! If it’s a long drive to the start point and a long day walk is planned, make sure you allow ample time to finish the walk in good time before dusk and avoid a long drive home in darkness, or worse, an unscheduled overnight stay in the bush! But for most walks on WalkGPS, a walker can generally leave Perth at 8.00am and be back well before 5.00pm, having completed a fulfilling, but not exhausting day’s walk. Walk areas on WalkGPS can generally be reached reasonably easily and safely without needing a 4WD vehicle, but often require driving some distance on unsealed gravel or dirt ‘country’ roads where special caution is needed. The Road Safety Commission provides some useful safety tips about the potential hazards of these roads and how to drive on them; Some key words to look for: gravel, sand, corrugations, pot-holes, camber, edges, dust clouds, speed, visibility, animals crossing, floodways. Also be aware that on slippery, wet clay-surfaced roads a vehicle’s tyre treads quickly clog with clay (4WDs no exception); The vehicle then loses traction and may slide around uncontrollably as if on ice, or dig into soft clay, making a mess of the road and adding a lot of mud to your car. In many outback areas such roads get closed immediately it starts raining. It’s best to stay off them if possible until they dry out – which they usually do quickly when the rain stops! When parking your vehicle at a walk start point or trail head, be mindful that parked vehicles can unfortunately be a magnet for thieves. The more popular public trailheads are especially vulnerable. e.g. Sullivan Rock parking area (for entry to spur track to Bibbulmun Track off Albany Highway); Lions Lookout (off Welshpool Rd, Lesmurdie); Hardinge Park (Bickley Reservoir picnic area/parking area); Bells Rapid carpark (end of Cathedral Avenue). Consider parking in a reasonably concealed location which isn’t visible to casual passing traffic. 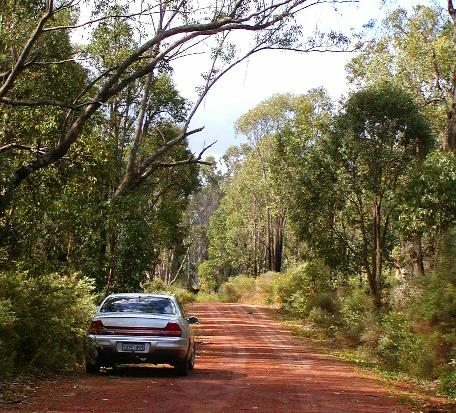 Don’t drive on bush roads that have restricted access due to the risk of the spread of dieback. All the walk areas on WalkGPS can be reached without driving on restricted access roads.